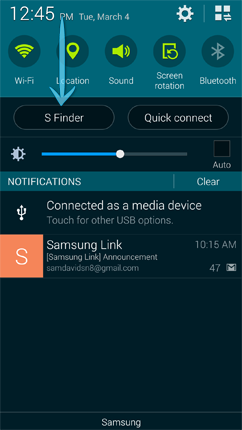 What is S Finder on my Samsung Galaxy S5 and how Do I use it? S Finder makes it easier to search for a wide variety of content on your device and the internet. You can enter keywords using your voice or the keyboard. To access S Finder open the Notification Panel by swiping your finger from the top of the screen to the bottom (this can be done within many applications, not just when on the Home screen) and then touch S Finder. Touch OK after you have read the helpful hints. Place a check mark next to Do not show again to bypass this screen. Enter a keyword in the Search box to begin searching the device. Touch to select filters such as date, locations, content type and content tags to narrow your search results. For a broader result apply a filter without a keyword. Results display order: Select from the following options: Frequently used category first, Currently used category first, Alphabetical or Custom. Category order: When you select Custom you can arrange which categories should display first in the search results. Touch and hold next to a category and drag it up or down to position it in the list. Select search category: By default all categories are included in the search. Unmark the checkbox to exclude the category. Save search history: Place a check mark next to the feature to turn it on. A history of your search entries will display in a list under the Search box. Delete history: Select results from your search history to delete. Select filters: By default all filter types are selected. Unmark the checkbox to exclude the filter in future searches.